Satisfied Clients are what Matters Most to Me! I am willing to spend whatever time you need and make the extra effort to find the “right” property for you and your family. 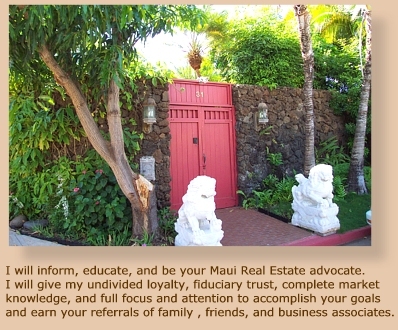 I am knowledgeable, and extremely proficient regarding Maui real estate and will answer or access information to answer your most difficult questions. I am supportive and committed to the highest level of personal service and will assure you that you will feel comfortable from our first contact through closing on your property. I understand the business of real estate; mortgage financing, depreciation for tax considerations, interest deduction on investment property, identification of like kind,1031 tax deferred exchanges, Maui market trends and specific property income histories. I will introduce you to reliable mortgage loan consultants, professional property inspectors, escrow and title companies. I have a dedicated professional team to assist you with all of your Hawaii real estate matters. I work in a ‘No Pressure’, informative, supportive manner; I will earn your trust and I will value the opportunity to be your trusted pro-active Maui advisor. I know that ‘timing is everything’ and I am easily reachable and accessible by Direct Cell Phone, and employ a full time Office Manager / Assistant who supports me and my clients moment to moment real estate activities. I will communicate with you regularly and have an advanced technology contact management database which I employ to keep my clients informed about comfortable with their transaction every step of the way. Whether I represent you in the Sale of your property or in the Purchase of your property, I will provide you with an American Home Shield Homeowner’s Insurance Policy, to insure that the fundamental systems and appliances you are selling or buying will perform properly. I am committed to your 100% Satisfaction, 100% Guaranteed. Thus I am comfortable offering you My Guaranteethat if for any reason you ever feel less than satisfied I will remain open to hearing your needs, concerns, and suggestions and should you desire to choose different representation I will release you gracefully from my services. “My commitment is to go above and beyond; my passion is exceeding your expectations; and my reward is achieving excellence in your eyes and earning your referrals of family, friends, and business associates!